If you had purchased $100 worth of Bitcoins in the middle of 2009 and held onto those coins until August 2017, you would have turned that $100 into more than $8,000,000. The lucrative world of cryptocurrency no longer has to be a mystery. This book will shock you. Secret strategies are revealed. Discover what cryptocurrency is all about and how to make a lot of money investing and trading in them. While the Bitcoin ship might have already sailed, it is not too late to jump onto the cryptocurrency bandwagon and make a profit in the process. 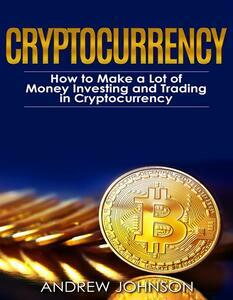 If you are wondering about how to go about doing just that then Cryptocurrency: How to Make a Lot of Money Investing and Trading in Cryptocurrency is the book you have been waiting for. Currently, only about 25 percent of Americans actually understand what cryptocurrency is and only about 2 percent use them on a regular basis. Despite this fact, all of the more than 1,000 cryptocurrencies on the market today have a market valuation of more than $60 billion dollars. Regardless of what you know about cryptocurrency as a whole, it is clear that this market is something to watch. Inside you will learn everything you ever wanted to know about the technology that powers cryptocurrency and how to tell a Bitcoin from a Litecoin, from an Ether and why that distinction matters. You will also learn how to choose the most promising contenders for the Next Big Thing and not lose your shirt while taking advantage of the high degree of volatility that the market is currently experiencing. An easy to understand breakdown of blockchain, the foundational technology at the heart of all major cryptocurrencies. A detailed explanation of how cryptocurrencies lose and gain value and how you can put these methods to work for you. Easy ways to get started investing in cryptocurrencies and everything you will need in order to do so effectively. Recommendations on the major cryptocurrencies to watch moving forward. A step by step guide to getting started mining cryptocurrencies and making money off of other people’s transactions. A look to the future including how major governments are looking to take control of cryptocurrency for their own ends.